Life is unexpected. Learning to just go with the flow and live with whatever life throws your way is definitely something many of us are still trying to learn. There are times when you just want to get out and explore the world, but the bills and rent need to be paid and next thing you know you're sucked dry! We've all been there, and it seems every pay check that comes along seems to disappear leaving us dreaming about our next pay day. It's really a vicious cycle. I have a bad case of the get-me-outta-here's. In fact, I haven't left Australia since my solo trip to Europe at the end of 2012, and it seems I'm no closer to my next trip across the ocean. I've been itchy to leave and explore another part of the world for quite some time now, two years in fact, and I'm starting to think I need a fix to get me through another 6 - 8 months before I can start planning towards something big. I have decided, that fix, is my home town, Melbourne. Quite often we see our home town as a space we want to escape, but simply getting away from the daily grind and spending time in exploration-mode could really solve my wanderlust on a budget woes! 1. Pack your bags like you're going somewhere new and exciting. I'm not sure about you, but I really like packing. There's something about carrying your life in a bag that's really comforting, well, for me at least. If you're a list-maker, make one! Spend time packing your bag like you won't be back in a while. 2. Don't forget a camera. This way you can capture moments in an authentic way. Don't use your iPhone to take photos, it doesn't feel as unordinary, because really we take pictures on our phones every day! Let's face it, lugging your camera around really makes you feel like a tourist. 3. Go to places you've never been before. Whether this outside of the city, in the country, or an unknown suburb that you've heard about. Do some research (hello Google my best friend) into towns that offer attractions you're interested in, whether that's beautiful scenery, cafes and restaurants, or history. 4. Take a long weekend! 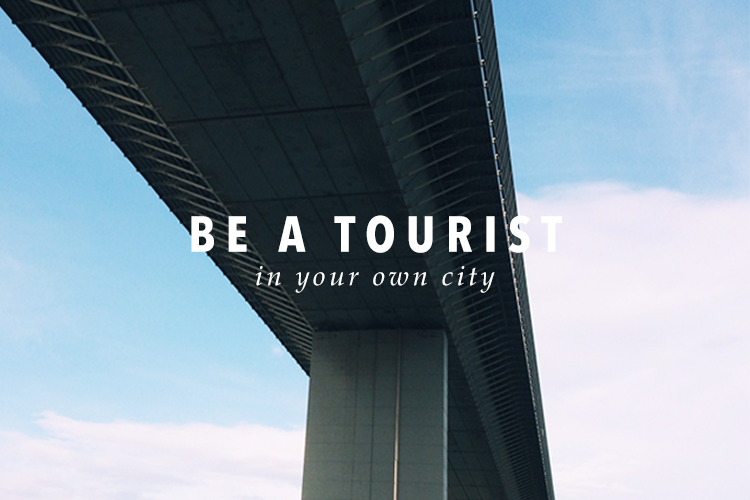 We all deserve a day or two off from time-to-time, so apply for annual leave and just go. You've got nothing to lose, and if you plan it in advance you get those days of excitement and planning beforehand. 5. Get lost! One tip that I find every avid traveler would agree with is, get lost. Wander around so aimlessly that you find yourself off the beaten track. When you find your way back to your home-away-from-home, you'll be quite impressed with either your map reading skills or your foreign language interpreting skills.